Mrs Figg wrote: where is Nymeria in the books? It was never clear where Nymeria was all the time Arya was wandering through Westeros. We do get dreams when she's in Essos. 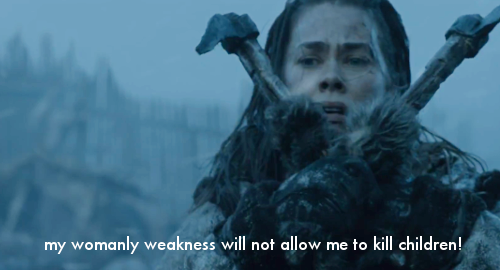 Nymeria is the little sister in the quote above. There is also a lot more focus on the river lands in which reports of prowling packs of Wolves led by a monstrous female are given... we presume it to be Nymeria because of the wolf dreams. I thought it was a good episode. Something happened! I will miss two episodes but I have got them recorded for later. bungobaggins wrote: I thought it was a good episode. Something happened! Did it? Like I know the battle was all very epic, glitzy and high level production wise, but I'm not sure it added much to progressing the story. I'll just post this here, as I thought it rather silly. “She was a guy originally, and then somewhere in the process we thought it might be cool if she were a mother, and show her sending off her own kids to make that moment with the corpse children really resonate emotionally,” Sapochnik explained. Game of Thrones.. the musical..? 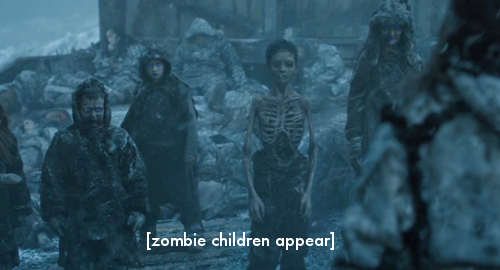 That is true, but TV viewers found out that Valyrian steel can kill the walkers. Things are happening in the far north. Everything south of the wall is pretty boring though. The stuff with Tyrion and Dany was good in my opinion. That's a book spoiler too, actually. Although it was heavily hinted at. Actually it brings me to one of my major gripes of the episode. What are we told about fighting the Others (white walkers) and the whights? Fire deters them. 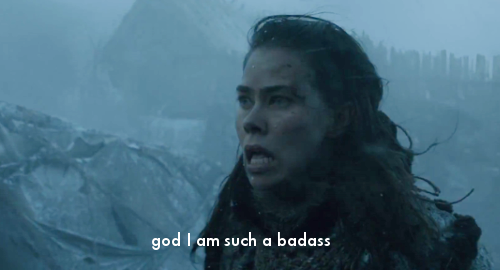 But no, we'll have one walk through a burning building like it's nothing.. And of course the Wildlings who are the only humans to come into direct contact with the Others and the whights, and would know how to fight them, attacks them not with fire, but with conventional weapons, normal steel, or more primitive weapons, and.. it kind of works. So, that really undermined the impact of the battle for me. They are meant to be this unstoppable force. Only fire can deter them. "Oh, no.. I'll just step on it's head." If presenting them on screen in fight scenes means you have to leave the previously established logic to make it look good, then perhaps that's a reason you shouldn't have that battle on screen. It was nice to see Tyrion and Dany together, leaving aseide the fact that their conversation went..
"You're the son of the man who killed my father, why shouldn't I have you killed?" "You have to convince me you're worthy of my service first." "Oh, well, then you should become my closest advisor." And the advice he gave her was simply.. bad. "The great houses won't support you. Not the Starks, not the Lannistes (despite me being here), maybe the Tyrells, but they are not enough.."
Forgetting the Arryns who the show established have no love for the Lannisters and have not depleted their resources or military might by war. Forgetting the Martells, who had Oberyn screaming to a crowd of people about who killed Dany's sister in law and nice and nephew during hte trial by combat last season..
Bluebottle wrote: I'll just post this here, as I thought it rather silly. Ah, I guess this is the reason I normally keep my opinions out of this thread. Because If you guys are enjoying it.. Well, I'm nothing but happy for you. Also, everyone needs to see this. It's... perfect. Bugger I have to wait until next week before I can watch ep 8.
oh i hated that the woman died i liked her so much. but correct me if i am wrong, those kids... weren't they her kids and that's why she froze? 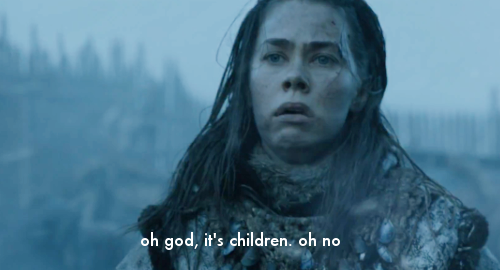 because she took her kids of the boat when she was doubting whether or not Jon Snow would go and make the gates open? it makes more sense that way..
Nope.. they were just random whight kids.. It's good to hold onto those headcanons though. Your idea makes more sense. A nice essay on the White Walkers/Others. Can someone explain to me how exactly the High Sparrow came into power? I know Cersei kind of gave him an in so she could mess with the Tyrells, but their sudden amount of power that they have (so much so as to imprison Cersei) makes no sense to me. Oh, they've always had power, it's just a matter of whether they choose to exercise it or have a leader who's strong enough to do so. It's not unlike the power the religious right has over the US Republican party. A better example would be the Catholic church and the kingdoms of Europe. Constantly shifting struggle, but theoretically the Pope could always excommunicate a King, effectively ending his rule. Henry VIII sidestepped this by creating his own church with himself as head, and we see similar mechinations in Westeros. Cersei wasn't paying proper attention and paid the price. She gave them the power to do all this though, right? Or in the books have they been there all along? They've been there all along. She didn't give them anything...except the rope to hang herself with.